The Absolute Beginners award-winning method has been designed to make learning the 5-string banjo easier than ever before! Step-by-step pictures take you from first day exercises to playing your first complete songs. Absolute Beginners Banjo gives you: An 'owner's manual' approach to the banjo; Practical advice and tips covering everything you need to know about setting up, playing and maintenance; A look-and-learn course that uses clear pictures to illustrate every step of learning; CD audio tracks to let you hear how things should sound, plus full-length accompaniments so you can play along! 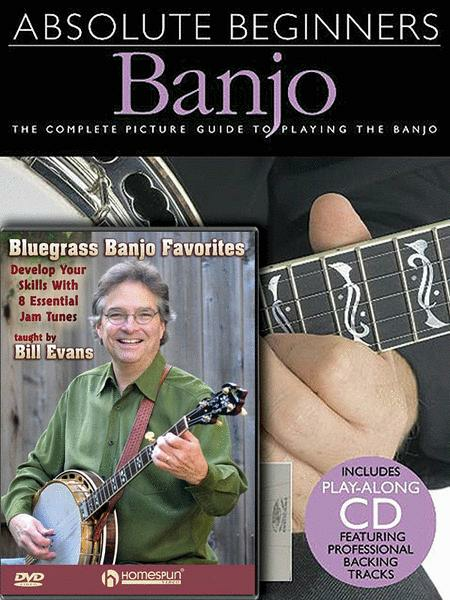 A bluegrass banjo pro takes learning pickers through eight must-know jam session instrumentals: Jesse James • John Hardy • Foggy Mountain Breakdown • Clinch Mt. Backstep • Old Joe Clark • Salt Creek • Fireball Mail • Soldier's Joy. Beginning-level students get basic instruction plus slow play-along versions; intermediate players will learn cool techniques for making each tune their own.